Tambaram Railway Station is one of the railway terminal of the Chennai Beach–Tambaram section of the Chennai Suburban Railway Network. It is situated at a distance of 6 km from the centre of Tambaram. It is situated in South Chennai and located 27 km from broadway. It is one of the fastest growing railway hubs outside Chennai Central in the southern direction. Everyday, on an average, around 3,50,000 commuters use the station. 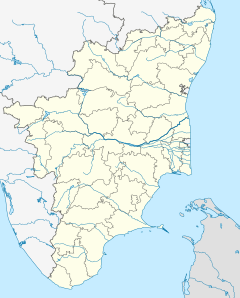 About 500 suburban electric trains operate from Tambaram, including those between Chennai Beach and Chengalpattu and Kancheepuram. Further, more than 25 expresses, including those bound for Howrah and other places in the north pass through the town. It is also third busiest station in the city (after Chennai Central and Chennai Egmore). The daily ticket sales at Tambaram fetch ₹ 1 million, half of which comes from suburban travellers. It is the second most revenue-generating station in Chennai after Moore Market Complex. A total of 52 trains pass through the station. Tambaram Railway Station divides Tambaram into East Tambaram and West Tambaram. There are nine platforms in the station. Platforms 1-4 are used for suburban trains between Chengalpattu and Chennai Beach and platforms between 5 and 9 are used by the suburban electric trains between Chennai Beach and Chengalpattu and Tirumalpur and also long distance express trains. Most of the suburban electric train services originating from Tambaram to Beach and Chengalpattu leave from the first two platforms. There is a foot overbridge connecting East and West Tambaram with access to all platforms. In 2008, Southern Railway started building an additional platform at the westernmost side of the railway station, making Platform No.1 a double-discharge platform, a design which helps commuters to alight on either side of the train, similar to the one at Park Railway Station, where the passengers could alight on the western side for quicker access to Chennai Central. The lines at the station were one of the first in Chennai to be electrified. They were energised on 1.5 kV DC in 1931 with the electrification of the Chennai Beach–Tambaram section, and the third line in the section was electrified on 15 January 1965. The lines further south from the station, up to Chengalpattu, were electrified on 9 January 1965. On 15 January 1967, all the lines were converted to 25 kV AC. Ticket sales at Tambaram Station are the highest on the suburban sector. Monthly sales of tickets, which stood at 0.712 million in November 2010, went up to 0.75 million in November 2011, when the state government hiked bus fares. It shot up to 0.837 million in December 2011 and to 0.871 million in January 2012. In April 2012, the figure touched 0.826 million. Nearly 95 percent of the tickets sold are on the suburban sector, while the remaining are to neighbouring and southern districts. As of 2013, about 20,000 people buy tickets at the station daily. The station's proximity to the Central Warehousing Corporation's godown located at Chitlapakkam makes it technically important. Four railway lines exist between Chennai Beach and Tambaram, two for up and down long distance trains and two for up and down suburban services. However, only two rail lines exist between Tambaram and Chengelpet, which are not enough to meet the growing demand of the section let alone its future requirements. March 2013 has been set as the deadline for the completion of the first phase of Tambaram station development project, and Southern Railway had prepared and submitted to the railway board a proposal to lay additional lines for a 30 km stretch from Tambaram to Chengelpet at an estimate of ₹ 2000 million but the board is yet to give its approval. As a first step towards this, Southern Railways plans to set up a coaching terminal at Tambaram at an approximate cost of ₹ 340 million. It will have pit lines for maintenance, stabling lines and additional platforms. The station had a huge metre-gauge freight marshalling yard for Chennai, which has been closed. It is also a former electric shed and home to the YAM-1 locomotives. Presently, the station has a broad-gauge EMU maintenance and car shed. The EMU car shed was established in 1931 and has adequate facilities to maintain 12-coach rakes. As of 2006, the number of staff in charge of maintenance at the car shed is six per car. Along the lines of a similar facility at the Chennai Central railway station, the Southern Railways constructed a bus bay in 2006 to serve the more than 100,000 passengers who travel by Metropolitan Transport Corporation (MTC) buses in Tambaram. On an average, Tambaram records an increase of 30,000 passengers every year for MTC buses. Everyday, 1,500 MTC buses are run from Tambaram to Mamallapuram, Tiruporur (on OMR), Kovalam and Vadamalli (on ECR), Sriperumbudur and Walajabad, among other places. In 2014, an escalator connecting East Tambaram with the foot over bridge and platform 1A was installed in the station, the first of its kind in a suburban station around Chennai. The new coach terminal constructed on the eastern side of the station became operational in June 2018. In 2011, the measures were taken to enhance the security at the railway station. Work on the integrated security system began on 17 August 2011, which will include more closed-circuit television (CCTV) cameras, door-frame metal detectors, baggage screening devices costing about ₹ 4 million and a separate control room for the Railway Protection Force (RPF) for better communication and co-ordination with the headquarters. The station, which has 14 CCTV cameras, will get 26 more CCTV cameras in important locations, including on Platforms 3 and 4, the parking lot and the coach shed. Laying of cables has already begun. The existing analogue cameras at Tambaram will be converted into digital cameras. The high-resolution CCTV cameras, capable of zooming down to 100 m and being remote controlled, are enabled with Internet Protocol. The ₹ 400-million Integrated Security Surveillance System (ISSS) project is implemented jointly by the Southern Railways and HCL Infosystems. On the Guindy–Chengalpet suburban section, comprising 17 stations, the Chromepet–Tambaram stretch remains the deadliest with at least 15 accidents a month. Tambaram has train facility from Early Morning 4 AM to Mid night 12 AM. For every 10 minutes we have beach to tambarm train. Chengalpattu to beach train flows for every 30 minutes. In the morning, the station is full of office goers. ^ a b Madhavan, D (18 August 2011). "Tambaram station ramps up security". The Times of India. Chennai: The Times Group. Retrieved 16 October 2011. ^ Madhavan, D (18 May 2012). "No subway, staircases at Tambaram, Chromepet put commuters at risk". The Times of India. Chennai: The Times Group. Retrieved 19 January 2013. ^ a b Manikandan, K. (22 October 2005). "Tambaram railway station building to open by March". The Hindu. Chennai: The Hindu. Retrieved 16 October 2011. ^ "Chennai Tambaram Railway Station Details". IndianTrains.org. Retrieved 16 October 2011. ^ Manikandan, K. (6 April 2008). "Additional platform coming up at Tambaram railway station". The Hindu. Chennai: The Hindu. Retrieved 16 October 2011. ^ a b Madhavan, D (24 March 2012). "Shortage of funds derails gauge conversion works at Tambaram". The Times of India. Chennai: The Times Group. Retrieved 31 March 2012. ^ Manikandan, K. (3 May 2012). "Long wait for tickets at Tambaram station". The Hindu. Chennai: The Hindu. Retrieved 3 May 2012. ^ Karthikeyan, K.; P. A. Jebaraj (17 January 2013). "Lack of counter staff irks rail passengers". The Deccan Chronicle. Chennai: The Deccan Chronicle. Retrieved 18 January 2013. ^ "Objection against Tambaram railway station as terminal". 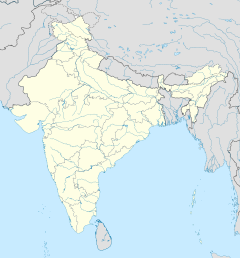 BehindIndia.com. 24 July 2010. Archived from the original on 7 September 2011. Retrieved 16 October 2011. ^ "South protests rail move on Tambaram". Deccan Chronicle. Chennai: Deccan Chronicle. 23 July 2011. Retrieved 16 October 2011. ^ Adimathra, George (21 March 2011). "Tambaram station plan hits end of line". Deccan Chronicle. Chennai: Deccan Chronicle. Retrieved 2 October 2011. ^ Vydhianathan, S. (19 September 2008). "Railways planning new terminal at Tambaram". The Hindu. Chennai: The Hindu. Retrieved 16 October 2011. ^ "Locomotive Sheds". Sheds and Workshops. Irfca.org. Retrieved 12 November 2012. ^ "Delay in launch of Tiruvanmiyur-Velachery MRTS service". The Hindu. Chennai: The Hindu. 24 December 2006. Retrieved 9 December 2012. ^ Madhavan, D (24 January 2009). "MTC begins operations from bus bay at Tambaram railway station". The Times of India. Chennai: The Times Group. Retrieved 16 October 2011. ^ Karthikeyan, K.; P.A. Jebaraj (6 January 2012). "Tambaram terminus work begins". Deccan Chronicle. Chennai: Deccan Chronicle. Retrieved 6 January 2012. ^ Madhavan, T. (21 April 2014). "Commuters at Tambaram station move up". The Hindu. Chennai: The Hindu. Retrieved 24 April 2014. ^ "New coach terminal comes up at Tambaram". The Hindu. Chennai: Kasturi & Sons. 9 June 2018. Retrieved 8 August 2018. ^ "Chennai: Suburban railway stations to come under CCTV surveillance". IBN Live. Chennai: The New Indian Express. 18 July 2012. Retrieved 14 January 2014. ^ a b Madhavan, D. (27 August 2011). "Pedestrians still cross tracks at Tambaram". The Times of India epaper. Chennai: The Times Group. Retrieved 16 October 2011. This page was last edited on 24 March 2019, at 01:42 (UTC).